GRAFENWOEHR, Germany — A small, tightly-wound book with pages primed for international stamps and the promise of adventure, the passport is perhaps the single most important object for smooth and lawful travel across borders. Two types of passports are important for DOD personnel and families stationed in Germany: the no-fee passport — distinguishing DOD civilians and command-sponsored family members as official government travelers — and the regular-fee tourist passport. In general, these international documents are used to verify citizenship, as primary photo identification and to entitle travelers to the protection of their country’s laws while traveling on foreign soil. Passport control officers use passports to determine whether or not foreign nationals can enter the country. But depending on the nature of travel, using one passport in place of the other could lead to major delays, fines or detainment at another country’s borders, according to travels experts. Determining the level of passport scrutiny is largely a matter of discretion exercised by nations and protected by internationally-accepted sovereignty. As a general rule, however, the U.S. Department of State and DOD warn that passport officers will deny — or, at the very least, delay — visitors attempting to enter with passports that do not reflect the true intent of travel, according Army in Europe Regulation 600-290 (Passports and Visa). The U.S. Army reported in a 2009 news release that many countries, including France, Great Britain, Egypt and many African states, will not accept no-fee passports for leisure and personal trips across their borders. 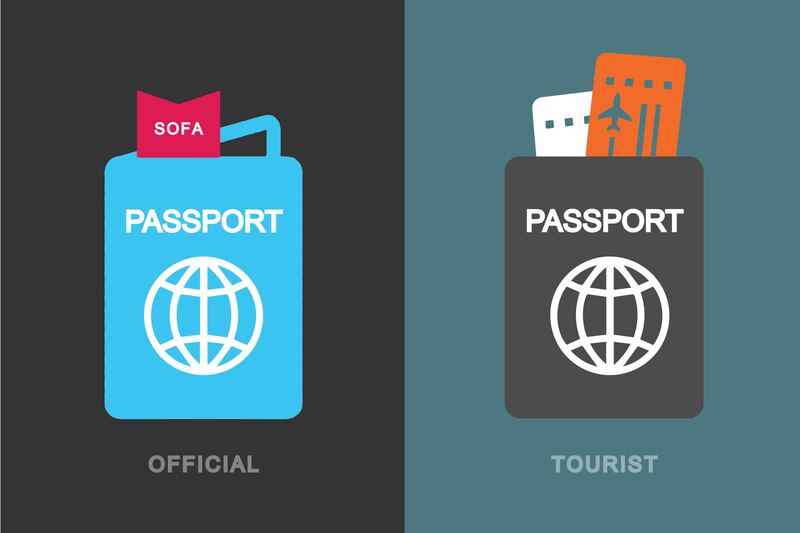 No-fee and tourist passports may look identical, but understanding the distinction could save lots of money, prevent hassles and ensure a safe return. Also known as the no-fee or special issuance passport, official passports are issued by specialized passport offices, such as those on military installations. Official passports allow eligible individuals to sidestep the lengthier tourist application process and receive the document free of charge. They are issued — with necessary visas — to personnel traveling in an official government capacity to a foreign country and are valid for five years. All U.S. citizens, including DOD civilians, contractors and authorized command-sponsored family members, must have a no-fee passport for overseas permanent changes of station, temporary duty assignments and missions. Each U.S. citizen accompanying the sponsor and listed on official orders — even infants — must have a no-fee passport. Non U.S. citizens must acquire passports from their countries’ nearest embassies or consulates. Service members are only issued official passports for missions to countries that do not accept orders as an authorized travel document. No-fee passports for German relocation have a Status of Forces Agreement, or SOFA, stamp. SOFA stamps exempt eligible DOD personnel from Germany’s 90-day visa limit and ensure they benefit from U.S. Customs subsidies. Non U.S. citizens in need of a SOFA stamp should contact the USAG Bavaria Passport Office for further guidance. No-fee passports are for “discharge of official duty” only and “when entering or exiting the country of assignment abroad,” according to the State Department. U.S. civilians and eligible family members stationed in Germany should only use their no-fee passports to enter and exit Germany — regardless of the purpose of travel. No-fee passports can also be used for travel to, from and within the United States and as a supporting or secondary form of identification during international travel. No-fee passports are just that: free. Apply at least four days before the passport is needed for travel. No-fee passports can be renewed seven to 12 months before they expire. Non-emergency issuance for no-fee passport applications and renewals can take up to 30 days to process. Applicants must submit paperwork to USAG Bavaria Passport Offices. The U.S. Embassy and Consulates in Germany are not authorized to accept passport applications. Tourist passports are required for international leisure, private business and personal travel. They act as proof of citizenship and establish travel status through visa stamps. Tourist passports are generally accompanied by a fee and have a significantly longer processing time. Here’s the good news: adult tourist passports are valid for 10 years. Tourist passports for minors, or anyone under 16, are valid for five years. Any person — regardless of citizenship — with plans for a personal trip across the border must have a tourist passport. U.S. tourist passports are only issued to U.S. citizens. In addition, U.S. minors must have both parents present to co-sign paperwork to receive a tourist passport. Non U.S. citizens must obtain passports from their countries’ nearest embassy or consulate. Tourist passports identify nationality and verify travel status through affiliated visas and travel stamps. These documents also serve as official international photo identification and are required for both entry into foreign countries and reentry into their country of citizenship. For more on visa and entry requirements for other nations, see the State Department’s country-specific breakdown. DOD personnel stationed in Germany must use a tourist passport to enter and exit countries outside Germany or the U.S. for personal travel. A family stationed in Germany and vacationing in Italy, for example, would use their tourist passports at the Italian border upon entering and exiting and their no-fee passports to reenter Germany. In fact, both the State Department and DOD recommend traveling with both documents. U.S. tourist passports are also accepted forms of identification for travel within the U.S. Adult tourist passports cost $135 for an initial issuance and $110 for a renewal passport. Tourist passports for minors, or anyone below 16 years old, cost $105. The Passport Office also helps with Consular Reports of Birth Abroad, which costs $100, and issuing newborn passports. In accordance with the State Department, the Passport Office only accepts cashier’s checks and money orders, which can be obtained from an on-post bank or post office. The State Department suggests applying for a tourist passport at least six weeks prior to international travel. Keep in mind, however, that overseas processing can take anywhere from eight to 12 weeks. The open renewal period for tourist passports is anywhere from two to four weeks before the document expires. Soldiers, DOD civilians and family members can schedule a passport appointment at the Passport Office through email or by visiting during open hours. To send an email or view building number and opening times for your location, visit the USAG Bavaria Passport page at https://home.army.mil/bavaria/index.php/about/Directorates/dhr/passports. The Passport Office provides photo services for no-fee passport applicants and both official and tourist passports for children under five years old. All other applicants must have standard photos taken outside the facility, such as at the Main Store photo booth or by a professional. For more on passport photo guidelines, see the State Department’s Passport Photo Requirements.